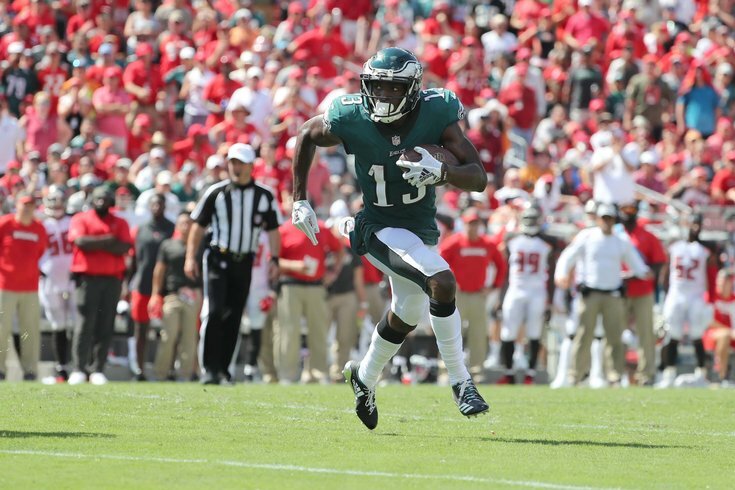 Philadelphia Eagles wide receiver Nelson Agholor. The Philadelphia Eagles fell to 1-1 last week with a disappointing loss to the surprising Tampa Bay Bucs, now 2-0 after beating back-to-back teams with Super Bowl aspirations. But this very well could be a different Eagles team taking the field on Sunday. Sure, they still have plenty of injuries to overcome and have struggled offensively through the first two weeks, but they should get a shot of adrenaline on Sunday. We've broken down the injuries, pointed out the key matchups to watch and offered our own predictions for the return of third-year quarterback Carson Wentz. Now, as we do every Friday, it's time to take a look around the nation to see how the various experts, both local and national, think Sunday's matchup is going to play out. • PhillyVoice staff: Once again, all five of us picked the Eagles to win. Jimmy Kempski thinks the Birds come away with a 27-16 victory. • ESPN staff: All 10 of their experts picked the Birds, which is one better than last week against the Bucs. It's easy to forget just how good Wentz was last season in every situation. He boasted the best QBR in the red zone, on third down and outside the pocket, per ESPN Stats & Information data, and was deadly against the blitz, throwing for 13 touchdowns and zero interceptions. There might be some rust, but Wentz's return will raise the Eagles' play to another level. Colts quarterback Andrew Luck could have continued success through the air, as the Eagles have allowed an average of 309 yards passing in two games. It's uncertain which Carson Wentz will show up for the Eagles, as the quarterback is playing his first game since tearing his ACL in December. These haven't been the same Eagles so far, but they get the edge because of Wentz's return. • CBSSports.com staff: All eight of their experts are picking Philly in this one. Last week, just five thought the Birds would win. Guess they're getting that Carson Wentz bump. • OddsShark: Their computer models are predicting an Eagles win, but a Colts cover. Last week, they correctly predicted a Bucs win, almost to the exact score. Carson Wentz is back, and so are the Eagles. Until Wentz gets injured again. Andrew Luck is looking good and Carson Wentz is a question mark, which makes me tempted to pick the Colts in an upset, but instead I’ll pick the Eagles to win a close one. The Colts sure do look better, but are they good enough to even hang around with Jim Schwartz's defense in a potential statement game in Philadelphia? We know how mentally strong and well coached this Eagles team is, and it's hard to imagine them not rallying for Wentz on Sunday. • SBNation staff: All eight of their football writers are picking the Eagles. The coin flip, however, picked the Colts, so ¯\_(ツ)_/¯. I guess I'll go with the way the Eagles defense plays at home vs. how it played against Ryan Fitzpatrick in Tampa last week. And I guess I'll hang my hat on Wentz's giving the team a strong emotional boost against a decent but not overwhelming opponent. The Reich factor bothers me a little; the Andy Reid Eagles seemed to always play well against Brett Favre. Maybe a win but not a cover? • Bleeding Green Nation staff: All seven of their writers are picking the Birds. Last week, six of seven incorrectly took the Eagles. Carson Wentz is back, though it will be important to temper expectations considering the severity of the injury he suffered in December, tearing two major ligaments in his knee. This will be the first time he’s been hit, at all, in nine months, and the Colts have a coach in Frank Reich who knows as much about Wentz as anyone in the NFL. The Eagles’ offense wasn’t great with Nick Foles at the helm, so it should improve, but barring an immediate return to form for Wentz, this one could be closer than people realize. It’s become apparent just how good the Eagles defense is at home vs. just about any team. It doesn’t matter if Andrew Luck was in his prime or just coming off an injury, I would firmly believe the defense shows up on Sunday. Away from home is an entirely different story, and one that must be fixed as soon as possible. But this week, we don’t have to worry about that. Don’t think Carson Wentz being back won’t juice the defense. They’re playing for him, too. This could turn into a laugher because the Colts seriously don’t impress me. But again, I thought that about the Bucs last week, too. Carson Wentz is back and ready to prove he is what he was before he blew out his knee, that the Eagles’ safety-first plan in his rehab paid off … and that he was healthy enough to return even earlier. The atmosphere in their home stadium for Wentz’s return might not be far off the electricity of banner night. If the entire team feeds off of it, it could be a long day for Andrew Luck and the Colts. Carson Wentz's return will get the Eagles' offense back to full capacity. Frank Reich will coach up the Colts on what to expect from the Philly QB, but Indy's limited defensive personnel will struggle. Philadelphia will look like the defending Super Bowl champion it is as the defense makes sure Andrew Luck can't lead a comeback.